Prof. Laurie Zoloth and Samuel Fleischacker, a professor at the University of Illinois at Chicago, discuss peace in the Israeli-Palestinian conflict and student divestment movements during a panel hosted Tuesday by Northwestern Coalition for Peace. The event promoted conversation and dialogue about the current situation both in and out of Northwestern. Northwestern Divest, a movement started last month advocating for divestment in support of Palestine, should distance itself from the Boycott, Divestment and Sanctions movement and clarify its agenda, several professors said during a Tuesday panel discussion hosted by Northwestern Coalition for Peace. 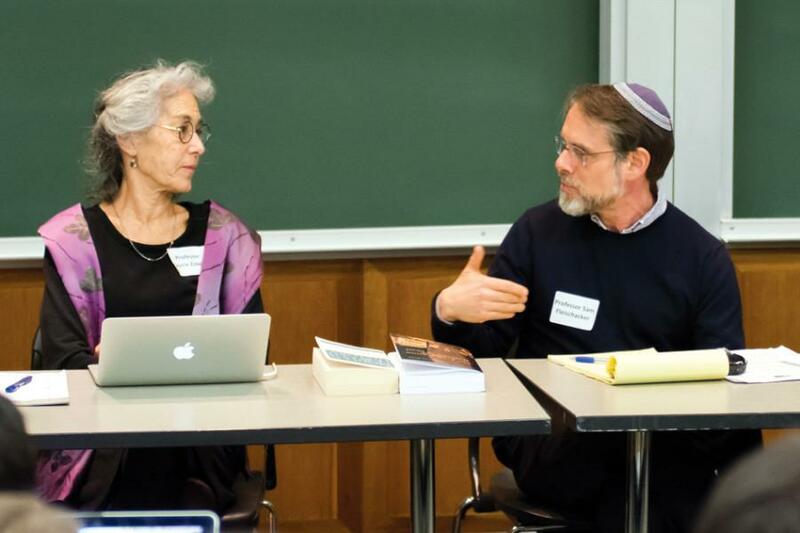 Religious studies Prof. Laurie Zoloth, NU School of Law Prof. Steven Lubet and University of Illinois at Chicago professor Samuel Fleischacker spoke to an audience of more than 40 people in Annenberg Hall. Each had the opportunity to answer questions posed by the coalition and audience members. All three panelists agreed that for NUDivest to be more transparent, it needs to clarify its agenda of peace and distance itself from the Boycott, Divestment and Sanctions movement created by Palestinian civil society in 2005, because they said some of the BDS motives oppose co-existence between Israelis and Palestine. Weinberg junior Ariella Hoffman-Peterson, organizer of the event, agreed. Prompted to offer his idea of a viable long-term solution to the Israeli-Palestinian conflict, Fleischacker, who said that in the past he participated in various boycott and divestment movements against South Africa, said the best choice would be a two-state solution with a Jewish state and a Palestinian state. “The ideal would be a confederation between the two,” he said. The panelists also discussed what needs to be changed in order to achieve peace both in the conflict and at NU. Fleischacker said the biggest obstacle for peace at the moment is Israel’s occupation of the West Bank. He said the solution is for Israel to stop the occupation, but the biggest question is how to do it. He said creating safe spaces where people with different viewpoints can come together and understand each other better is a way to further conversation between the peaceful sides of the conflict. Panelists discussed the role of NUDivest on campus, referring to a Letter to the Editor published in The Daily in January. In the piece, NUDivest organizers said supporters of NUDivest don’t need to have a “historical background on the conflict, nor do they need to be in support of any particular nation or political solution.” They also said those who support human rights should be in favor of NUDivest. Zoloth said she understood where this comment from NUDivest was coming from because she advocates against oppression. However, she said this is a complicated narrative where the problem needs to be studied better before forming a concrete opinion. This article was updated for clarity at 1:46 p.m. Feb. 11.